HVAC stands for Heating Ventilating and Air Conditioning. Should I worry about my indoor air quality? The Environmental Protection Agency (EPA) states that indoor air pollutants can be 100 times greater than outdoor air pollutants. If you would like an assessment of your system and efficient it is at catching/removing indoor pollutants please call us at (208) 522-7933 or (208) 589-4938. An air filter should be changed every 3 months. This will help improve your system’s lifespan and your family’s health. When an air filter is not changed every 3 months your system works harder and harmful pollutants are in the air. If you would like us to come out and service your system please call us at (208) 522-7933 or (208) 589-4938. How do I know my A/C unit is running efficiently? After having your air conditioner serviced by us, we can tell you about any problems we found and how to avoid them in the future to keep you and your family safe. If you have questions about upgrading your system you can give us a call at (208) 522-7933 or (208) 589-4938. What is wrong when I can't feel any air? Your filters may need to be replaced. Your air conditioner may be low on Freon or the blower motor might be struggling to spin as well. If you are struggling to find the reason, you can give us a call at (208) 522-7933 or (208) 589-4938. R-22 Freon is regulated by the EPA. 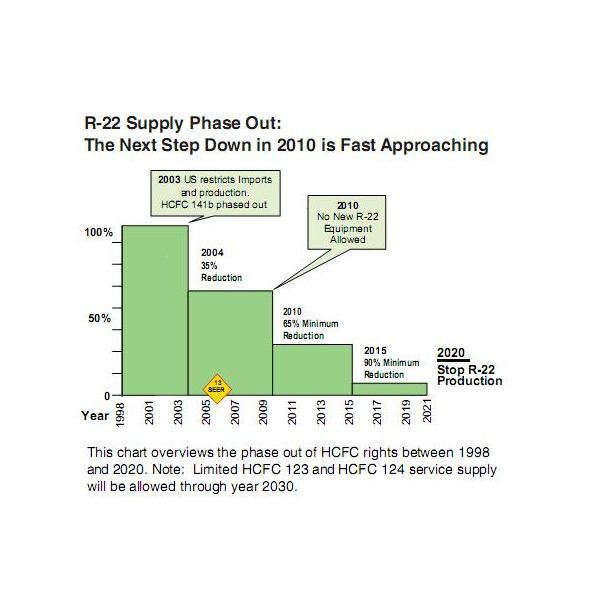 They have stopped production of R-22 Freon so the price has increased. The image below represents the phase-out of R-22 Freon. You may click on the image for more information. The new Freon is considerably less expensive and more efficient but a system upgrade is required for some homes. If you would like to discuss a system upgrade please call us at (208) 522-7933 or (208) 589-4938. If I turn my unit on and off will I save money? Turning your system on and off will force your system to work harder. Best results are found when your system is set at a constant temperature. If you would like to improve the efficiency of your unit you can call us for upgrade options at (208) 522-7933 or (208) 589-4938. How do I know if my air conditioner is working properly? Is your air conditioner making strange noises? Are some parts of the home cooler than others? Does it take longer to cool your house compared to previous years? Is your energy bill unusually high? If you can answer yes to questions like these then there is probably an issue with your air conditioner. Call us at (208) 522-7933 or (208) 589-4938 to have an HVAC technician come to your home in Idaho Falls or in the surrounding areas. We even offer service to Western Wyoming. How do I know if my air conditioner is big enough? A bigger air conditioner is not always the best option. Performance, energy efficiency, and the size of the space you need cooled are the key factors in choosing the right air conditioner. Call a Mora’s Heating & Cooling to have a specialist thoroughly assess your home for the right air conditioner for you. Call (208) 522-7933 or (208) 589-4938 for service in Idaho Falls, the surrounding areas, and Western Wyoming.